Colorado's Hidden Wonders, photographs, coffee table book. Colorado is well known for its national parks and iconic locations, such as the Great Sand Dunes, Maroon Bells, and Rocky Mountain National Park. However, it also harbors many scenic wonders that are little known and seldom visited. There are colorful, mushroom-shaped rocks on the eastern plains, white, serrated volcanic rocks in the southern mountains, and a large number of natural arches along the Western Slope. In Colorado's Hidden Wonders, renowned nature photographer Grant Collier transports you to these remote regions by way of 95 breathtaking photographs. Collier has spent several years hiking along strenuous trails and driving over difficult jeep roads in search of these landscapes that time forgot. The images he captured during these excursions have produced a portrait of Colorado that few knew existed and even fewer have experienced. "Collier gives us all the stuff we cherish about the backcountry of Colorado, exquisitely reproduced in such detail that you keep going back to the pictures, discovering more each time." - Colorado Central Magazine. 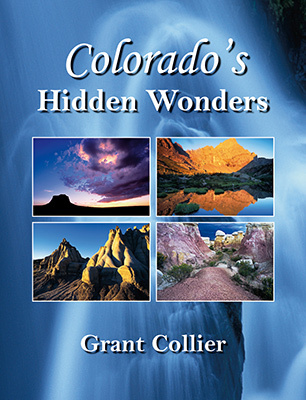 Colorado's Hidden Wonders was selected by the Rocky Mountain News as one of their "favorite books of 2006"